Product is tested for Paraffin Sections, Western blot / Immunoblot, Enzyme Immunoassay. Suitable for Immunoblotting (Western or Dot blot), ELISA, Immunoperoxidase Electron Microscopy and Immunohistochemistry as well as other peroxidase-antibody based enzymatic assays requiring lot-to-lot consistency. 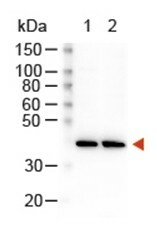 Rabbit secondary antibody conjugated to horseradish peroxidase (HRP) is available in a variety of formats. 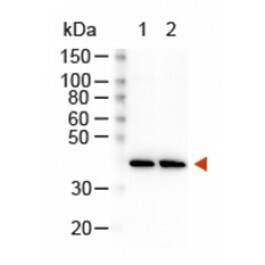 HRP Anti IgG secondary antibody conjugate is suitable for ELISA, Immunohistochemistry, Western Blotting as well as other HRP antibody based assays. Do Not Add Sodium Azide. Prior to reconstitution store at 2-8°C. or (in aliquots) at -20°C for longer. Assay by Immunoelectrophoresis resulted in a single precipitin arc against anti-Peroxidase, anti-Goat Serum, Rabbit IgG and Rabbit Serum.